Materials and Methods: The study was conducted with 180 patients who were categorized into disease stages in accordance with the Clinical Dementia Rating Scale (CDR) and 150 healthy individuals of the same age group. 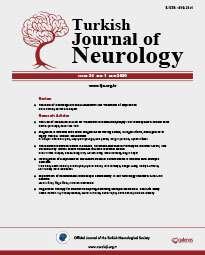 In our retrospective study, patients who showed more than one cognitive disorder and diagnosed with possible AD according to the diagnostic criteria of NINCDS-ADRDA (National Institute of Neurological and Communicative Disorders and Stroke-Alzheimer’s Disease and Related Disorders Association) were administered CDR, Mini-Mental Test (MMSE), Geriatric Depression Rating Scale (GDRS), and the individuals in the control group were administered MMSE and GDRS. Venous blood samples for biochemical studies were collected after 12-14 hours of fasting in patient and control groups. Results: In AD diagnosed patients, it was found that there was a statistically meaningful increase in age and duration of disease parallel with the progression of disease stages, and a decrease in UA and albumin levels in both males and females (p <0.05). Conclusion: Our study supports the hypothesis that the decrease detected in serum UA levels in parallel with the progression of disease stages is directly related to the AD. The detection of changes in easily accessible, low-cost parameters such as serum albumin and UA levels is very important for the detecting and taking measures against chronic and progressive diseases such as AD during the early stages, especially considering the limited preventive effects of the treatments that are administered following the AD diagnosis.